Whenever starting a new project or room at home I have always loved mixing different products to design the kind of room that comes close to the idea I have in mind at first. I believe that the first idea you come up with is always the best and for me that's always based on a certain atmosphere I want to create. I love a combination of basic and new sometimes even shiny elements, combined with something raw, such as an industrial piece of furniture, and naturals such as wood, bamboo, rattan or rubber. No need to tell you I prefer things to be monochrome in combination with soft grey tones. When IKEA challenged me to make a Pinterest board and design my ideal bed & bathroom and asked me to invite you to do the same with some great prices to win, More on that at the end of this post! the combinations above were the focal points for my new Pinterest board: #IKEAcatalogus – A new bed and bathroom! Today IKEA launched their new Pinterest board showing items from their new catalogus : IKEA zoekt interieurontwerper! |IKEA is looking for an interior designer| From this board and other inspiring pictures I found, I created my own Pinterest board #IKEAcatalogus – A new bed and bathroom! showing my ideal bed & bathroom. I'd love to challenge you and make your own inspiring Pinterest board to join this competition with great prizes to win! 2: Pin as many pictures as you want from the IKEA zoekt interieurontwerper!, any other IKEA boards and everything that inspired you to create your ideal bed & bathroom. 3: Don't forget the hashtag #IKEAcatalogus or IKEA will not be able to find your board! The winner with the most inspiring board will be invited to bring her or his Pinterest board to live, and create the actual rooms at IKEA Amsterdam together with one of the IKEA interior designers. You will also receive an IKEA gift voucher worth €2.500. The contest will run from today till September 12-2014. See my own Pinboard here: #IKEAcatalogus – A new bed and bathroom! scroll down to see how I made it, now show me yours! Good Luck and see you at IKEA Amsterdam! Having a bright bedroom at the moment I thought I'd challenge myself to create a bedroom with some more darker tones. I guess in the ideal life I should have two bedrooms, one for summer and one for winter! How great would that be! 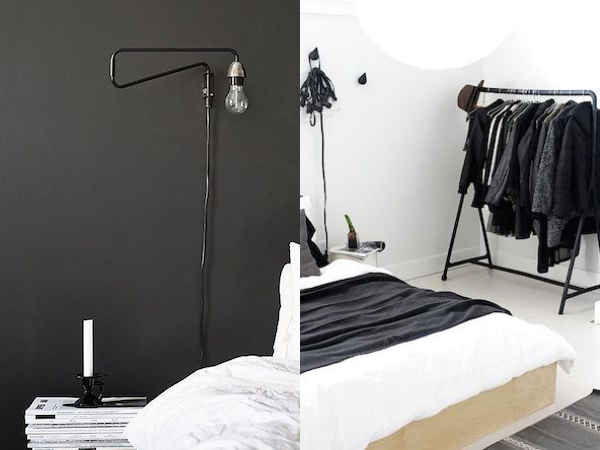 * Definitely one black wall - I love to write on them and black is a beautiful backdrop for my monochrome poster and photo collection. 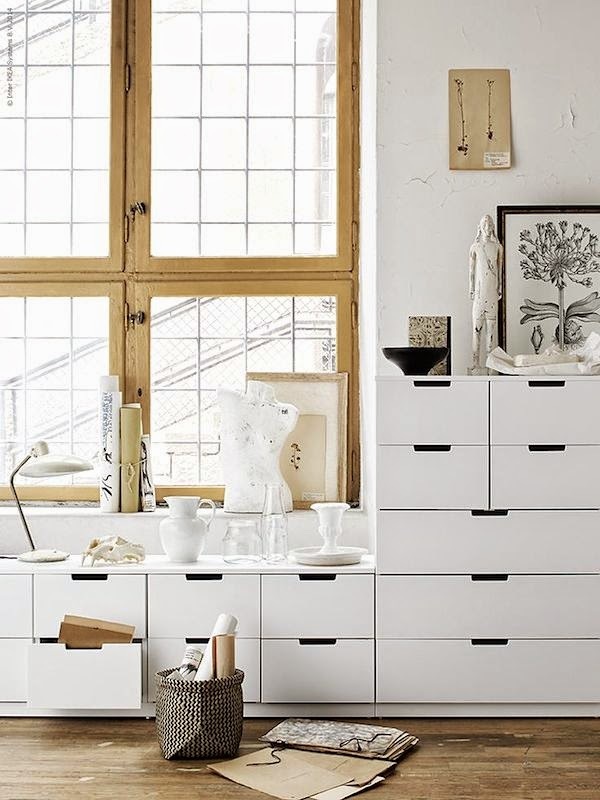 * Ribba leches - They are my all time favourite IKEA pieces, great for quickly changing pictures, I'd need some black ones to add at he new black wall! * A black clothing Rack - I love to easy choose from my favourite pieces and it is highly decorative. * An old industrial table or cart as a bed side table, ideal for magazines and candles. * Some bed lights - for reading and cozy ness. A huge mirror - I love free standing mirrors. * New boxspring with a thick mattress - Having a boxspring for years I would love to have a new one and an even thicker mattress for it, I love the luxurious feel. * A bedhead - ideal when working in bed with the laptop on lazy Sunday mornings and on my wish-list for years. * Knitted blankets - for extra an extra cozy feeling. * Lots of cushions - the more the better I'd say and preferably in different fabrics. Maybe some velvet for a bohemian feeling. * Rug - a rug under the bed for a nice out of bed feel. * Some blinds - I love how you can catch the sunlight with them. * Curtain rail - a cool industrial curtain rail. * Linen curtains - an old favourite and I love to see them a bit longer. * Candles - for a cozy light and a warm touch on cold winter nights. * And finally storage - as one can never have enough storage and I love a decorated but uncluttered bedroom at the same time. I'd probably go for a wall with some white cabinets, adding a black marble countertop And display my favourite photo books and some art objects. 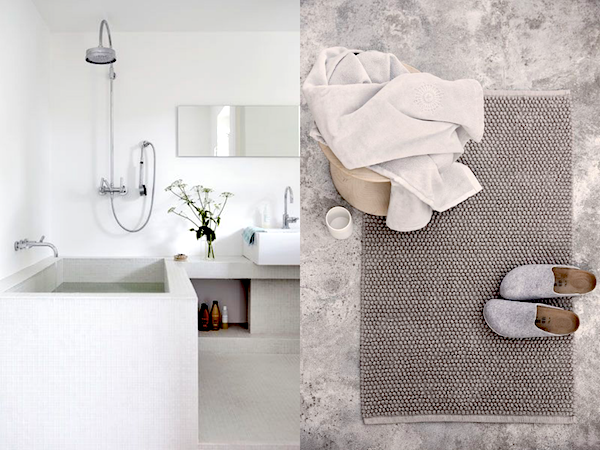 * A light grey concrete floor and soft bath rugs. * Big white sink - I'd love to get rid of the small sink I have. Wouldn't mind it standing on a concrete countertop. * White shiny cabinets to store accessories we do not need to see. * A bath! - because I never had one.